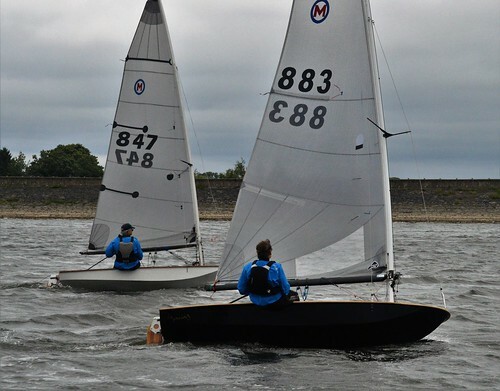 With the Nationals due in early August, the Maidenhead Open was the last chance for the Moth sailors to size up the opposition. 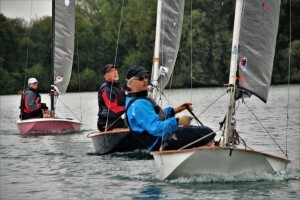 For the first time, the MSC Open was held in the late afternoon, with three races to be held back-to-back. 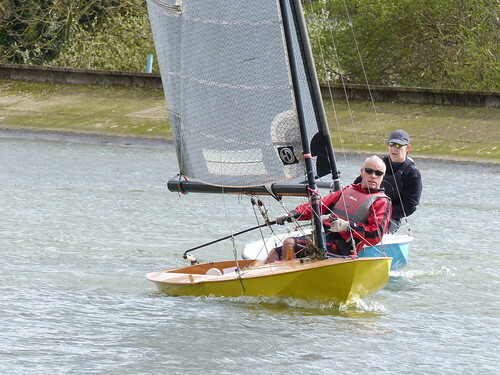 Despite the later start, many of the fleet arrived early to make use of the warm sunshine and free time on the lake for tuning purposes. 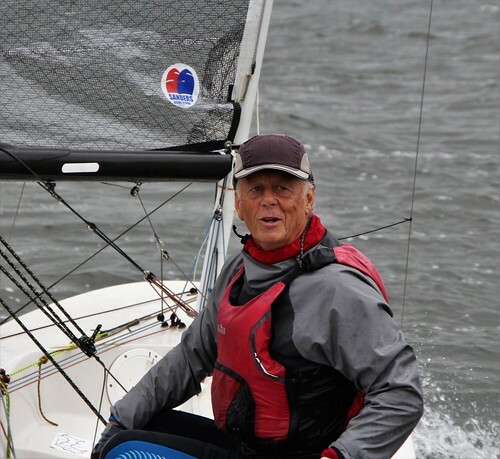 But, by the afternoon, the weather turned, and the fleet started the first race in squalls and heavy rain. 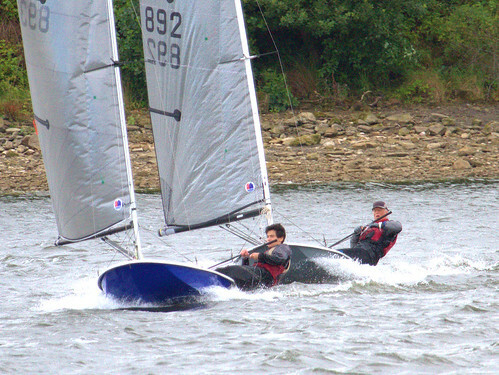 The fleet got away cleanly in the southerly winds. Toby Smith (Medley SC) managed to get ahead early, pulling away and leaving fellow club member Tim Davison some distance behind. 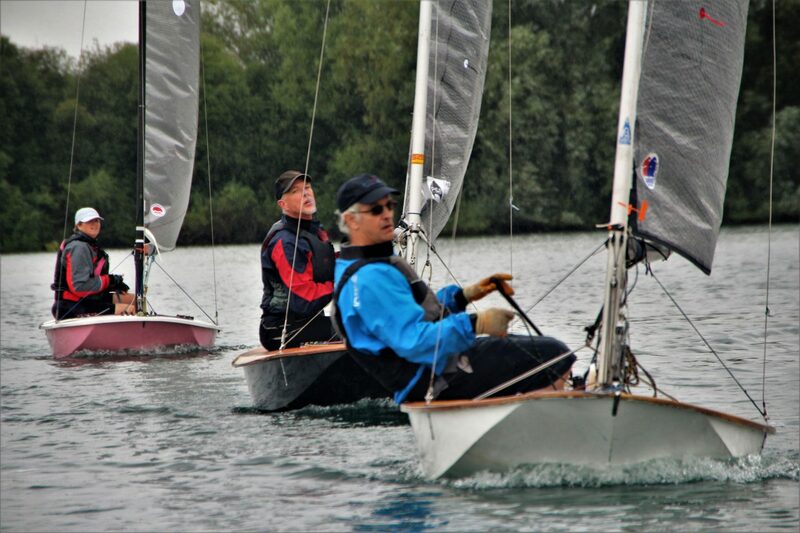 By first lap’s end, Smith was still ahead of Davison, with Andy Mathews (Chew Valley SC) close behind in third place. One lap later, Davison had managed to sneak past Smith, who remained determined not to let Davison out of his sight. As the wind speed varied over the race, the fleet kept spreading out on the downwind legs to make best use of the wind conditions. 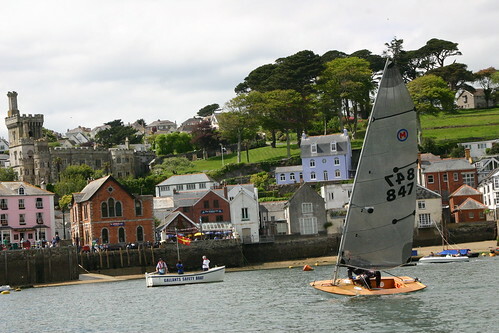 The efforts of the remainder of the fleet came to nothing, however, as they failed to close off the leaders and the first boats finished within seconds of each other. 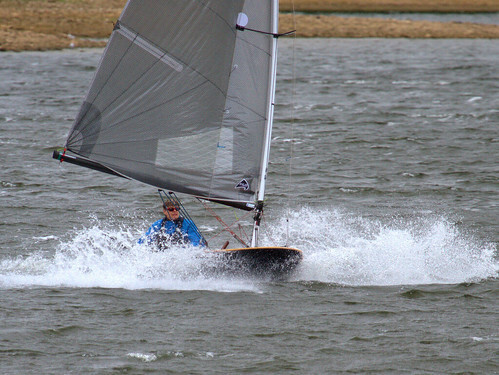 The second race started in calmer (and slightly drier) conditions immediately after the first race. 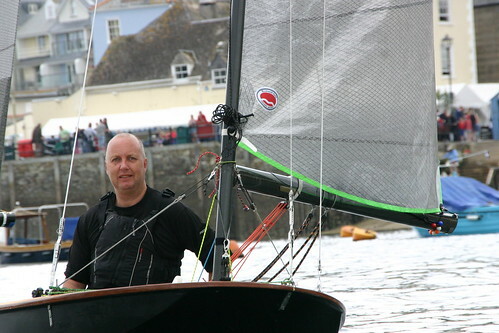 This time Davison got clean away and rounded the first mark well ahead of the remainder of the fleet. He was followed by Elaine Laverty (MWYC) who also got a good start. 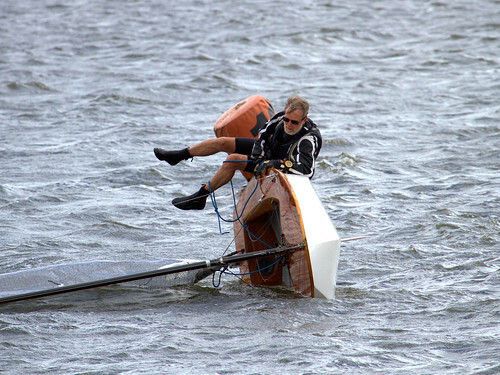 Smith, who started poorly, tried his best to catch her but failed to close the gap. Despite best efforts all round, the top positions remained unchanged: Davison in first place; followed by Laverty and Smith. 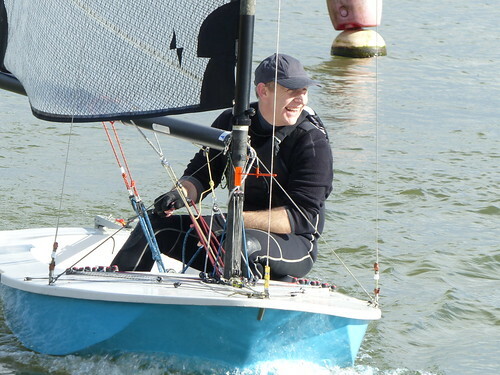 With all the sailors cold, wet, and in need of warmth, the OOD decided on a short break before the last race to allow the sailors and race crew a well-deserved hot drink and change of clothing before going back on the water. A slight last minute wind shift changed the favoured end of the line, making for a close positioned start. Davison managed to fight his way through the fleet, with Mathews following hard on his stern. 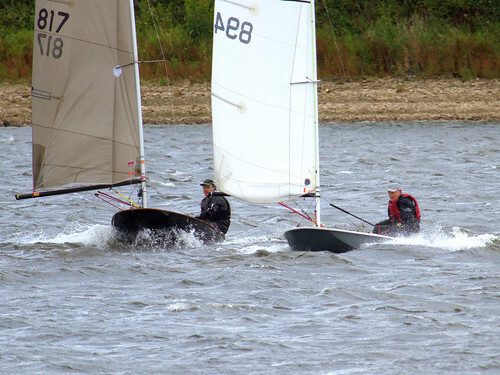 On the first run off the wing mark the majority of the fleet covered each other in the middle of the lake, but poor starter Simon Hall (Maidenhead SC) who had been caught on the wrong end of the line, took an alternate route to the third mark by hugging the east bank and managed to gain six places to second place by the third mark. 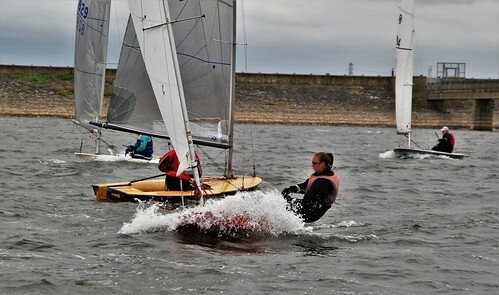 Davison continued to dominate the lake, and the other sailors took advantage of Hall’s wing mark route, to position themselves better on the lake. 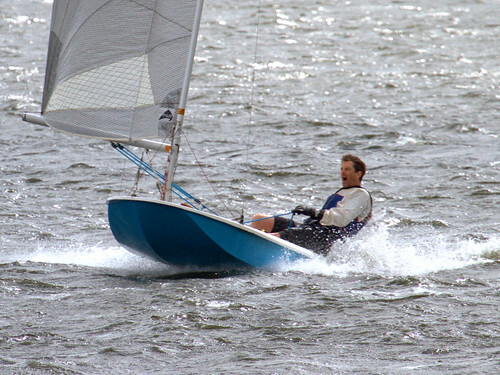 A poor choice by Hall saw him passed on the second lap by half the fleet, leaving him in sixth. With conditions deteriorating, the race was shortened to two laps, with Davison in first, followed by Mathews and Smith. Racing over, Davison was first overall, and with the same points it came down to last-race placings between Mathews and Smith. Thanks to his second placing, Mathews just sneaked in, taking second overall, leaving Smith in third. 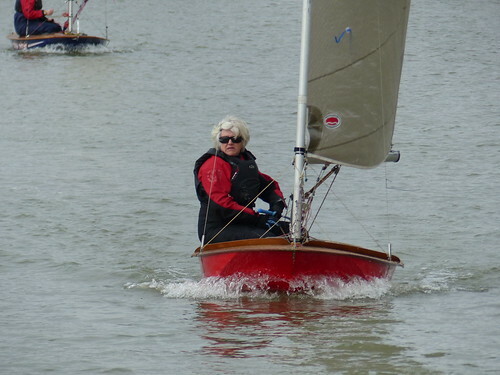 Laverty took Ladies Champion, and Jenny Bentley (Maidenhead SC) took First Vintage Boat.